Updated for 2019! My North American Chocolate Easter Bunny & Egg Round-up has become so long that most people didn’t even notice I had listings for Australia, the U.K., and the rest of Europe, too! So I decided to break out the European and Australian dairy-free Easter chocolate options into this dedicated post. And there are some delicious new options, especially for dairy-free and vegan chocolate Easter eggs. The following chocolatiers offer dairy-free Easter chocolate delights, including chocolate bunnies and chocolate Easter eggs, and even some delicious carob and passover treats! 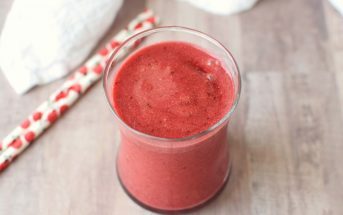 Most are also vegan and gluten-free, and some are soy-free and nut-free. But please check with the companies if severe allergies are a concern. Some have allergen-safe processes, but others produce milk chocolate on the same lines as their dairy-free Easter chocolate goodies. 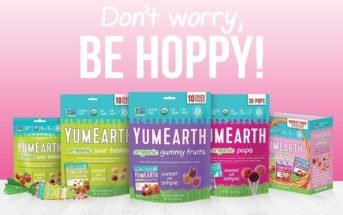 Alpha – The Easter line-up at this Australian confectionery includes bags of chocolate mini eggs and large chocolate eggs that are dairy-free, gluten-free, and nut-free. Asda – Their own “Free From” range includes an indulgent line-up of chocolate button-filled chocolate eggs in white and dark varieties. They’re free of dairy, eggs, and gluten. Beech’s – This UK chocolatier ships worldwide, so everyone can enjoy their vegan dark chocolate fondant and mint crisp mini eggs, and their larger dark chocolate eggs. Booja Booja – If you want to make a real impressions, consider getting something from their Easter Egg Collection. It’s an elegant gift in an array of designs, all dairy-, gluten-, and soy-free. Chococo – This UK chocolatier has an array of Vegan Easter Gifts, including new jumbo Milc and Dark chocolate Easter Eggs. Coco Caravan – Vegan chocolate Easter eggs with a dairy-free caramel center are the Easter specialty at this UK confectionery. They’re “raw” and sweetened solely with coconut blossom nectar. 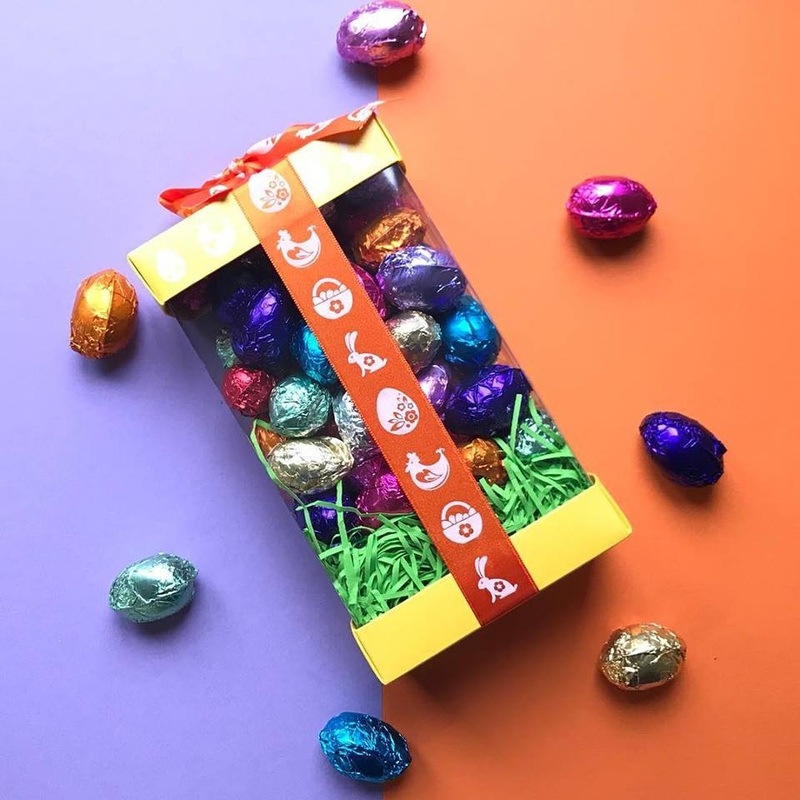 Cocoa Libre – They make dairy-free, gluten-free, nut-free, and vegan chocolate in the U.K., and their Easter line includes adorable rice milk Easter chicks, orange chocolate eggs, and more. Cocoaloco – This traditional UK chocolatier makes a dark chocolate, vegan line of Easter eggs (some spiked with ginger or cherries and almonds) and bunnies. Choices by Celtic Chocolates – This line is free of dairy, eggs, gluten and nuts, and it includes both white and “milk” chocolate egg and bunny options. Their website is a bit sparse, but their products are sold in major grocers, like Aldi, in Europe and Australia. D&D Chocolates – They specialize in dairy-free, nut-free and gluten-free chocolate confections and have carob treats. Each year they offer ample adorable Easter options. Decadent Handmade Chocolates – This vegan chocolatier in Australia has added more Easter options in recent years. They include milky-vegan cream eggs, rabbit bars and allergy friendly freckled eggs. Divine Chocolate – This year they’re offering tasty bags of dark chocolate mini eggs that are vegan. Goupie – The name Goupie doesn’t make me think of gourmet vegan chocolate, but that’s exactly what this UK company makes. For Easter they have a few varieties of large chocolate eggs, including Salty Sticky Toffee. Green & Blacks – Simple and sophisticated, their organic dark chocolate egg is back. Holland & Barrett – For the past few years, H&B has made a dairy-free Milk Chocolate Style Egg, and this year it comes with Bunny chocolate bar. The pair is also produced without gluten, soy, and nuts, but it may contain traces of soy. Kinnerton – They are rebranding their “free from” range as “Just Chocolate.” It includes a dairy-free, egg-free, gluten-free, and nut-free Easter Egg made from luxurious dark chocolate. They are a UK company, but are now selling in stores in Australia, too. Lindt – Their dark chocolate, foil-wrapped bunnies are made without dairy, and can be found in most countries. Montezuma’s Chocolate – This is a traditional chocolatier, but they offer vegan dark chocolate cheeky bunnies and button-filled eggs. This year they’ve also added vegan peanut butter-filled chocolate mini eggs. And for purists, they also have an “Absolute Black” sugar-free egg option. Moo Free Chocolates – We love that Moo Free is strictly dairy-free, and that they now have five varieties of their big chocolate Easter Eggs. We reviewed the tasty Bunnycomb and Original ones here. But they’ve since added Cheeky Orange, Organic Dark, and Organic Sea Salt & Caramel chocolate eggs. You can find them in Europe and Australia. MummyMeagz – This “Indulgent Vegan Kitchen” in the UK makes just one Easter treat, but it’s a good one: a vegan version of Cadbury Cream Eggs! Plamil – Their chocolate is branded as “So Free” and it includes a nice Easter range. This year you can find their big eggs in No Sugar Added Dark Chocolate, Milk Chocolate Alternative, and White Chocolate Alternative. They’re also offering half eggs and bunnies made with their “milk” chocolate. Their products are sold in both Europe and Australia. Rhythm 108 – New for this year, they’ve launched Swiss Chocolate Truffle Mini Eggs that are filled with creamy chocolate ganache. They’re vegan, gluten-free, organ, all natural, and sold at Sainsburys. Sainsbury – They have a “Deliciously FreeFrom” product line, and this year it includes several dairy-free chocolate eggs. 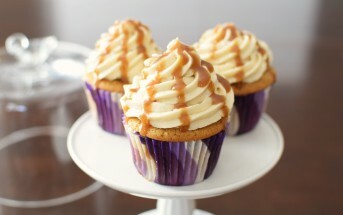 The flavors include “Buttermilk” Honeycomb, “Milk” Chocolate, White Chocolate, and Strawberry & White Chocolate. So Sweet Couture – If you’re looking for raw artisan chocolate, then this UK company has you covered. Their dairy-free, gluten-free, and vegan Easter goodies include milky and white chocolate Easter bunnies, the “splat” egg, and more. Sweet William – Australians have good reason to be proud of this chocolatier. They make dairy-free, gluten-free, nut-free, and vegan chocolate with seasonal options, like chocolate Easter bunnies. Sylvia & Terry – Their vegan options include chocolate mini eggs and larger dark honeycomb Easter eggs (made without honey!). Treat Dreams – Specialty shops in Australia will carry their Dream Eggs. These Cadbury copycats are vegan, but have that classic “cream” and “yolk” filling. This year, they also have limited edition flavors, like pineapple, bubble gum, and strawberry. Animal Aid – They don’t have their own brand, but all of the chocolates they carry are suitable for vegans, and they offer a good Easter selection. Asda, Sainsbury, and Holland & Barrett are also retailers who sell other brands of dairy-free and vegan Easter chocolates besides their own. Order your Dairy-Free Easter Chocolate early to allow enough time for your bunnies and treats to arrive before the holidays! 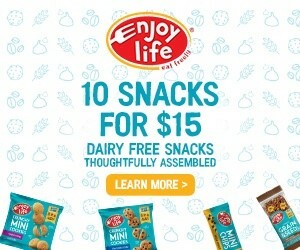 Be Allergen Aware: Again, if your special diet needs are particular, please read this article carefully and inquire with the manufacturer prior to purchasing. Also know that products, ingredients and processes may change at any time. Always double check with the manufacturer before purchasing or consuming any food whenever there is a food allergy concern. On Gluten: Most of the above dairy-free Easter chocolate options are made without gluten or wheat, according to their ingredient lists. But, cross-contamination with gluten could still be a potential for some of these companies. Always double check with the manufacturer on their production processes if cross-contamination issues are a concern for you. 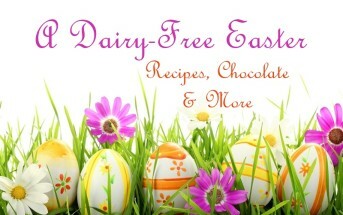 For more dairy-free holiday deliciousness, see our posts for Easter and Passover. 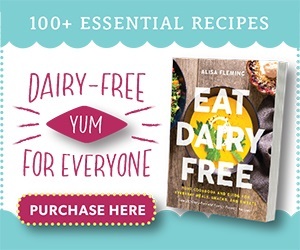 For More Dairy-Free Living Guidance, Get Go Dairy Free! 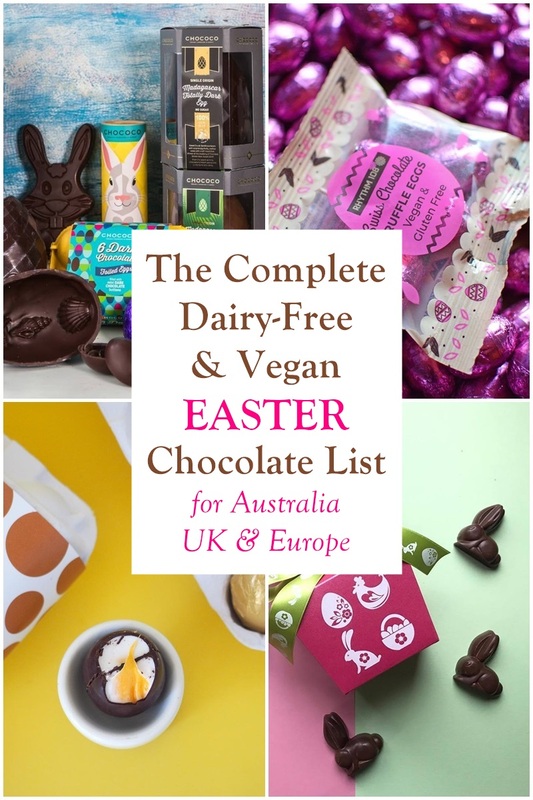 Did we miss any Dairy-Free Easter Chocolate Sold in Europe or Australia? Leave a Comment! How long is the delivery to Australia and will the chocolate be ok ie: not melted or broken? Hi Dani, I’m not sure which one you are referring to and wouldn’t be able to answer shipping times as I don’t work with the companies directly – this is just a guide! I’ve included links to each chocolatier / retailer in this post so that you can order from them directly and inquire with each as needed. How long for delivery to UK?